Al Haymon’s Professional Boxing Championship Series returns to NBC this Saturday, with a card broadcast from Brooklyn’s Barclays Center. Both televised fights have promising potential. Unbeaten light welterweight Danny Garcia will face tough veteran Lamont Peterson and unbeaten middleweight Peter Quillin will battle WBO belt holder Andy Lee. Those are two well matched fights between fighters who are all ranked in the top five of their division. But the card also underscores the complete joke that world titles have become in today’s era of alphabet soup shenanigans. Garcia is the WBC, WBA and lineal champion at 140 pounds and Lamont Peterson holds the IBF belt, so this should be a unification fight, with the winner walking away in striking distance of becoming an undisputed champion. Instead the fight is taking place at a 143-pound catchweight. It’s still a very compelling bout, but it loses something when the two fighters are unwilling to risk their titles. It has long been speculated that Garcia is getting ready to move up to welterweight, which would make some sense. But if he wants to move up to welterweight he should do it, and vacate his belts at light welterweight. Quillin, meanwhile, will be challenging for a belt that he already gave up last year. Last year, Quillin was unwilling to defend the WBO strap against mandatory challenger Matt Korobov. Korobov represented a relatively unknown, but potentially dangerous, opponent. Quillin vacated rather than face him. Lee stepped in and fought Korobov for the vacant belt, scoring a sensational Round 6 TKO. With his high-profile win and his Irish background, Lee is an extremely marketable fighter and suddenly Quillin is anxious to retrieve the belt he tossed into the rubbish. Few situations have done more to diminish boxing’s image in the past 30 years than the proliferation of alphabet soup titles. The WBA and WBC split off in the early 1960s, but often recognized the same champions. Unification fights were routine. Since the emergence of the IBF and the WBO in the 1980s, the situation has become permanently clouded. The four sanctioning bodies themselves do little to help bring clarity to the matter, especially the WBA, which has an insulting habit of recognizing both “super” world champions and “regular” world champions. In today’s era, belts can help a fighter build a reputation, but it’s ultimately the fighters who make the belts. A “world title” is only going to be as prestigious as the fighter who holds it. In the case of Danny Garcia, though, those titles have true meaning, although they are starting to lose it, since Garcia has now gone over a year without defending them. Still, he beat Hall of Famer Erik Morales to win the WBC strap. He stopped Amir Khan to add the WBA belt. He defended successfully against top contender Lucas Matthysse (who had previously smashed Peterson, in yet another absurd catchweight bout). Few fighters in the sport have a better claim to being No. 1 in their weight class. Which makes it discouraging that Garcia won’t be defending that claim, and shoring it up, by fighting Peterson at 140 pounds. I try to be a glass-half-full guy. 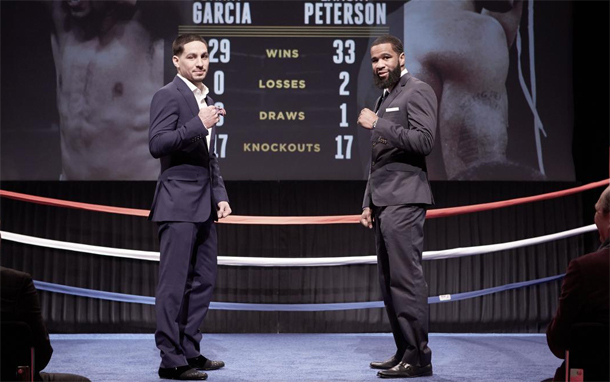 So I’ll repeat: Garcia vs. Peterson is a terrific match up, no matter what weight it takes place at. But if we’re going to be real, we’ve got to admit that there is still a lot of milk missing from this glass. Follow Briggs Seekins on Twitter at #Briggsfighttalk and check out his blog, Pioneers of Boxing, to read about the early, bare-knuckle days of the sport.